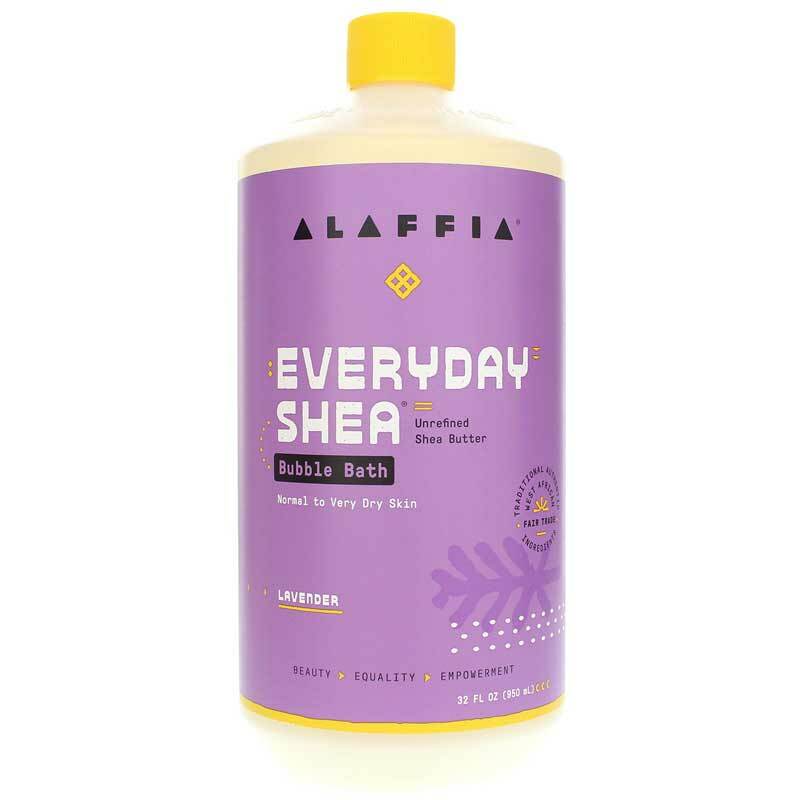 Lavender EveryDay Shea Moisturizing Shea Butter Bubble Bath from Alaffia is a paraben-free bubble bath with Certified Fair Trade Shea Butter. 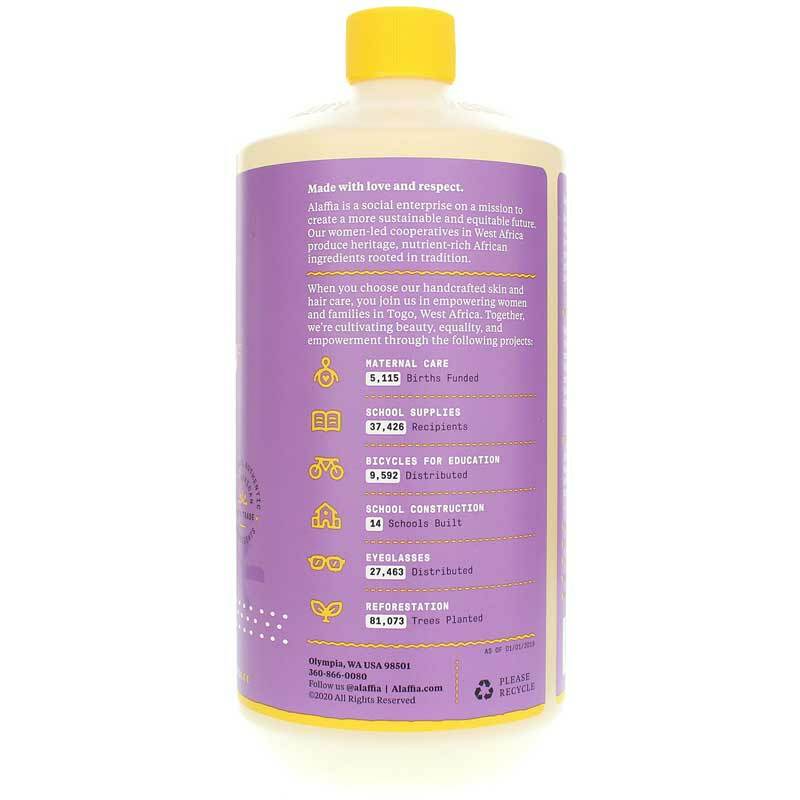 This naturally foaming, non-irritating, gentle bubble bath is handmade by Alaffia. Contains moisturizing shea butter to nourish and soften your skin. Infused with fresh herbal extracts - clary sage to uplift the spirits and calm nerves, and African yam to help regulate mood and promote relaxation. Dioscorea spp. (Yam) Leaf Aqueous Extract, Decyl Glucoside, Lauryl Glucoside, Lavandula hybrid (Lavender) Oil, Butyrospermum parkii (Shea) Butter*. Shake gently (separation is natural). Pour bubble bath into stream of running water as tub fills. Use approximately 1 ounce for regular tubs. Follow up with EveryDay Shea Moisturizing Body Lotion. Use only as directed. Excessive use or prolonged exposure may cause irritation to skin and urinary tract. Discontinue use if rash, redness or itching occurs. Consult your physician if irritation persists. Keep out of the reach of children except under adult supervision.